Are you embarrassed to send people to your outdated website? Have you ever cried over your keyboard or lost sleep over your broken diy site? enough of that. i can help. Imagine visiting the website of your business hero. It’s oozing with personality, easy-to-navigate, and perfect down to the last pixel. You instantly trust them and know you’ve come to the right place. Before you know it, you have your credit card in hand, ready to buy whatever they’re selling. What if your website had the same impact on your ideal audience? It effectively communicates the value of your services, moves visitors toward your end-goal, and makes a lasting impression. Free up time to focus on the parts of your business and life that light you up! Ditch the tears, headaches, and time wasted googling fixes for your diy site. Finally, send people to your website proudly and without hesitation. Stand out among your competition with an irresistible digital presence. Fill your inbox with inquiries from the kind of clients you’ve always wanted. Take your business to the next level by looking like the professional you are. You are one-of-a-kind, and so are your needs – that’s why my website packages are tailored to suit your unique goals. If you’re looking for a modern, captivating website that’s thoughtfully designed to attract and convert your ideal audience, click below to start a conversation and get your custom quote. I work primarily with service-based entrepreneurs and business owners who have been in business for at least 1-2 years and have a firm grasp on their goals. Interior designers, marketers, consultants, coaches, wellness professionals, stylists, writers, Airbnb hosts, and other passionate service providers…you are my people. You may have a website already, but it’s a source of stress in your life and it makes you cringe to send people there. You are ready to invest in a website that’s as legit as you are and partner with an expert you don’t have to micromanage. The cost of your project is broken into 3 parts. A 50% deposit is required upon signing to hold your spot on my calendar. The remaining balance will be broken into two installments. Payments can be made easily online by credit card or bank payment. I also accept check if that is your preference. I usually book up at least a couple of months out, but reach out to confirm my availability! This system of scheduling projects in advance allows you enough time to complete your design homework before we start. To get the best results, I recommend booking your project at least 2-3 months before you want to launch your site. Project duration varies depending on the size and complexity of your site, but the typical duration is 4-6 weeks from project kickoff to launch. Timeliness of communication from the client, holidays, the number of revisions requested, and the amount of content support needed (if any) can also impact the timeframe. An estimated timeline will be included in your custom proposal so you know what to expect going into the project. Can we use Squarespace, Wix, or Showit? I build exclusively with WordPress and the Divi Theme by Elegant Themes for all of my web design projects. Divi, a feature-rich and versatile drag & drop builder, is my go-to theme because it allows my clients the flexibility and confidence to make edits and additions as needed after launch. This means your website can easily evolve with your growing business over time! If your heart is set on Squarespace, Wix, or ShowIt, let me know and I would be happy to recommend some of my favorite designers for those platforms. Can you help me with content? Absolutely! My website packages typically start with you being responsible for all of your own website content; however, if you would like help fine-tuning your copy or writing it from scratch let us know! I offer copywriting and content creation services that can be included in your custom website proposal. What happens when we're finished? Don’t worry – I won’t leave you hanging after your site has launched! We will schedule a live training session to go over how to use your new site, I offer 30 days of free technical support in case any additional questions come up after our training, and you will also have access to a library of helpful tutorial videos to refer back to as needed! Additionally, we offer affordable monthly support plans where we handle ongoing maintenance and updates so you can focus on running your business! View our plans here. I do! In fact, I encourage it. 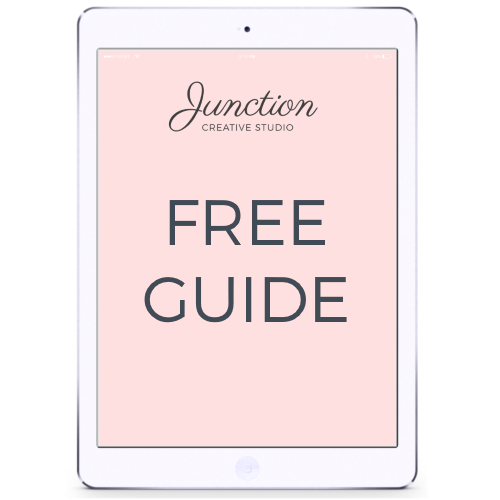 I want you to get the most out of your beautiful new website, which is why I offer affordable Maintenance and Support Packages, available exclusively to Junction Creative Studio web design clients. I recommend that you sign up for one of my 3 plans (Maintain, Manage, or Propel) so I can ensure that your site remains in tip-top shape: up to date, backed up, and safe from malware. Leave the technical stuff to me so you can focus on running your business! View plans and pricing here. Are you ready to elevate your business with a beautiful, effective website?